More from my youth. 98 was one of eight 1938 forward entrance Weymann bodied Leyland TD5’s delivered to the Northern General subsidiary of Tynemouth and District. They were FT 4496/4503 numbers 96/103. About 1950 in common with many pre war vehicles they were given a new lease of life and re bodied. 100 is seen here with its second body, and you could be forgiven for asking how ECW bodies came to be in a BET fleet? Well in fact they’re Northern Coachbuilders H30/26R. I’m aware of one example of the type that’s still around, NVK 341 is a beautifully restored 1950 Newcastle Corporation AEC Regent 111 and has been featured on this site. I don’t know if the doors on the Weymann’s were powered or manual and almost certainly they would not have been equipped with heaters, but they seem to have been well ahead of their time. Does anyone know of any survivors? I am not familiar with Northern General, but the forward entrance Weymann body looks very much like the ones mounted on AEC Regent chassis for Midland General in the late 30s. I can remember travelling on one of these about 1953 on the C5 Alfreton to Nottingham route. I don’t think the sliding doors were powered. 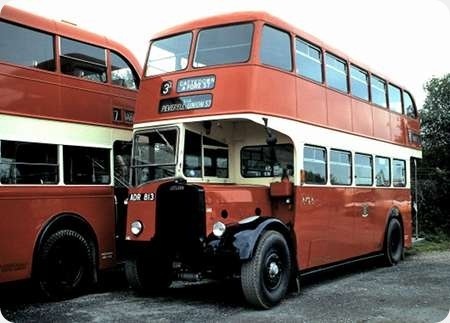 Trent also had some similar ones, but these were rebodied with conventional rear entrance Willowbrook bodies (lowbridge from memory) around 1950 I think. It’s remarkable to that immediately before WW2 Nottingham had three different operators with forward entrance double deckers – since Barton also had quite a lot of Leylands, some of them rebodies of older vehicles bought second hand. These were not Weymanns however. I’m very pleased you mentioned those Stephen because one thing I noticed was that although the Trent and Midland General Regents both dated from 1937 and both were bodied by Weymann, they were somewhat different. The MGO bodies were basically same as the Tynemouth example above. The Trent examples had an odd, longer length second window bay which resulted in a much shorter rearmost side window on both decks. Also, the bulkhead under the canopy had a single window on the MGO vehicles whereas on the Trent ones, there were twin windows. 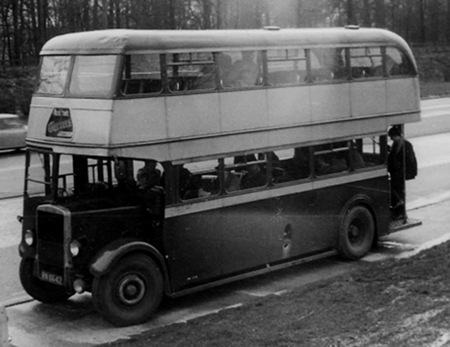 So, it would seem that Weymann had more than one front entrance double deck design in production at the same time. It makes you wonder why certain operators preferred such subtle differences. Some very nice views there, Ronnie! Weymann were renown for their metal framed bodywork and classic designs. Pre-war, there were three separate products – Flexible, Coachbuilt and Metal. Coachbuilt approximated to the composite framework used by Charles H Roe up to 1968. The featured body is a composite body. Mansfield District/Midland General had both composite and metal bodies in the pre-war period. The first photograph – that’s an original, right ? After classic coaches, the second love of my life is the amber nectar….I’m not a historian, but genuinely amazed that Carlsberg existed all those years ago and, even more amazement, they hoped to sell it in the North East in competition with Newcastle Brown !! Stuart, according to the encyclopaedia website, that brewing company was founded in 1847, and now controls a fair number of brands. The list might make you weep into your drink but includes Tetley and Scottish & Newcastle . . .
An equally surprising ‘brewing’ fact is that lager, per se, was so popular in an era when most folk seemed to drink ale, porter or mild and bitter. 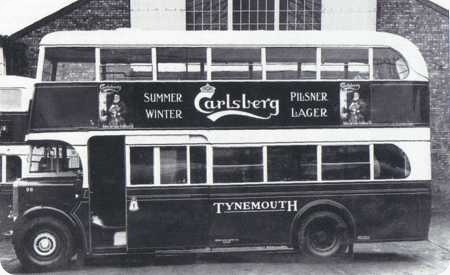 I’ve seen pre- 1914 adverts on trams for Tuborg lager and one, dated 1908, for ‘Alsopp’s British Lager’ To me, lager seemed to take off in the late 1950’s. Presumably you stuck your Carlsberg on a boat and just headed west. Do you notice that they were anxious to explain that Lager (or Pilsner if you not sure what to call the stuff although it was always a long way from Pilsn) was not just a cold summer drink…? They succeeded! Unusual to see a bus that looked so good in both incarnations, though for sheer character I go for the front-entrance original. The nice lining-out and dignified fleet name are a fine finishing touch. Did Northern Coachbuilders build these ECW lookalikes on licence, or to order, or simply as the sincerest form of flattery? Their own designs always look very good to my eye as well. Ian. An ECW man was enticed to NCB just before NCB’s major shareholder died and they were landed with crippling death duties which did for the company. This body is closer to ECW’s original than the Newcastle Regent III – which has slightly odd (uneven) bay spacing. 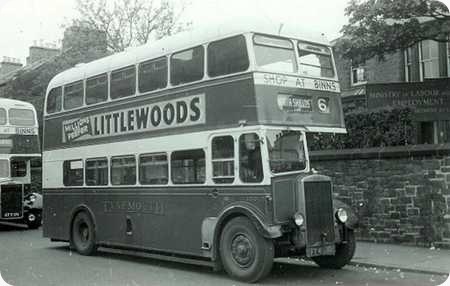 I can remember seeing these front entrance double deckers on the Blyth – North Shields Ferry service 7 as a small boy around 1949-50 an once did a return trip on one accompanied by my aunt. These were very different to the usual AEC Regents allocated to this route. I have enjoyed looking at the old photos I worked at Percy Main from 1963 until 1969 but I can not remember Ronnie Hoye but you sure know your buses. Ray, do you have a Brother called Brian, who was a fitter at Percy Main?